Even though most of the companies we hear about having their cyber security breached are large public companies, this issue is a major one with small businesses. In a recent USA Today article, “44% of small businesses have been attacked, according to a 2013 survey by the National Small Business Association, an advocacy group. Those companies had costs averaging $8,700.” Some of this percentage is associated with the major corporations that were hacked and the fact that they work with small business but none the less, it is a key issue that should always be addressed. Almost three years ago, Barefoot made a conscious decision to upgrade the platforms that are running our software. We looked for the best company we could find, and security was one of the primary concerns. We moved to a company called Quality Technology Services. One of the reasons we chose them was because of the security measures they offered us. The Barefoot system is actually behind TWO unique and separate firewalls to protect from any cyber-attacks. Your data is protected with the firewalls, systems back up every day, and one of the best trained systems teams providing Barefoot and all our customers the most secure tool available to our clients. In the vacation rental management industry, cyber security is of the utmost importance. Think about what clients give over the web when booking accommodations – names, addresses, credit card numbers and more. That is why it is so important to know how to protect businesses from cybercrime. Update Update Update. We cannot say this enough. It is more important than ever to update your systems. Not only do you need to update your operating system but you need be sure to update software and browsers when you are alerted to do so. Hackers, programmers and other cyber criminals find open doors in programs and systems to pull information. To counter and protect, computer software and hardware providers are on top of the latest cyber hacks, phishing, spyware and viruses that attack computer systems. By staying on top of updates, you can prevent a world of heart ache not to mention very angry customers. Limit Administration. Always be careful to limit who has access to the administration of the site. This is especially important in terms of who has the authority to install programs on company computers. Additionally, it is essential to block to restricted sites so that company employees cannot access private information. Secure Everything. This starts with installing anti-viral software and firewalls to prevent phishing software, spyware, and other attacks. Also, be sure to encrypt everything from the wireless networks to files so that the information is not accessible. On top of this, for employees with computer access, ensure that they change their passwords on a continuous basis not to mention keeping those passwords secret. Invest in Security. Small businesses typically think they are not susceptible to cybercrimes or they cannot afford additional risk prevention but it is simply too important not to invest in security to prevent phishing and attacks. There are so many ways to enhance and increase cyber security of computer systems to protect companies. And with October being Cyber Security Month, there is no better time to look into it. As many winter market vacation rental management companies head into their heavy seasons, each and every company needs to take the time to look at its vacation management software provider to ensure that cyber security is one of its primary features. After all, this business depends on it! 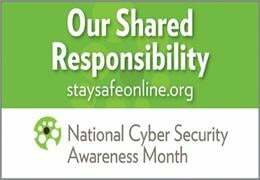 More information about Cyber Security Month can be on the Department of Homeland Security's website at http://www.dhs.gov/national-cyber-security-awareness-month-2014.